The LDI-619 Series LVIT (Linear Variable Inductive Transducer) position sensors from OmegaTM are contactless devices designed for factory automation and a variety of industrial and commercial applications such as motor sport vehicles, automotive testing, solar cell positioners, wind turbine prop pitch and brakes, and packing equipment. 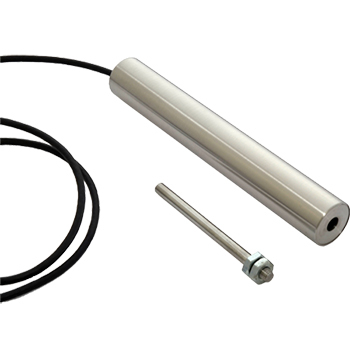 With their compact device, rugged stainless-steel construction, superior performance, and excellent stroke-to-length ratio, the LDI-619 sensors are ideal for both industrial testing, laboratories, and OEM applications. LDI-619 sensors are offered in 15 full scale ranges from 15 to 900 mm (&frac58; to 36"). Calibration and set-up is simplified with one wire field programming feature, this provides the ability to match the end points of the sensor's analog output with the ends of the range of motion of the assembly to which the sensor is attached. This feature permits a user to optimize the position measuring system's resolution over its full range of motion. LDI-619 products come with axil exiting cable & a M5 x 0.8 threaded end for installation.